One of my favorite Easter memories is making pysanky with my parents, sister and friends. We stood at the stove for hours, carefully applying melted candle wax in patterns on hard-boiled eggs, using a straight pin from my mother’s sewing room stuck into the eraser of a wooden pencil as our stylus. In between layers of wax, we dipped the eggs in dyes, starting with the lightest yellows and proceeding through to the darkest purple. The art of pysanky is said to be ancient, rooted in Eastern European pagan customs of sun worship ceremonies. A symbol of life and hope in many cultures, the egg with its yellow yolk was a tangible stand-in for the sun; the white representative of the moon. 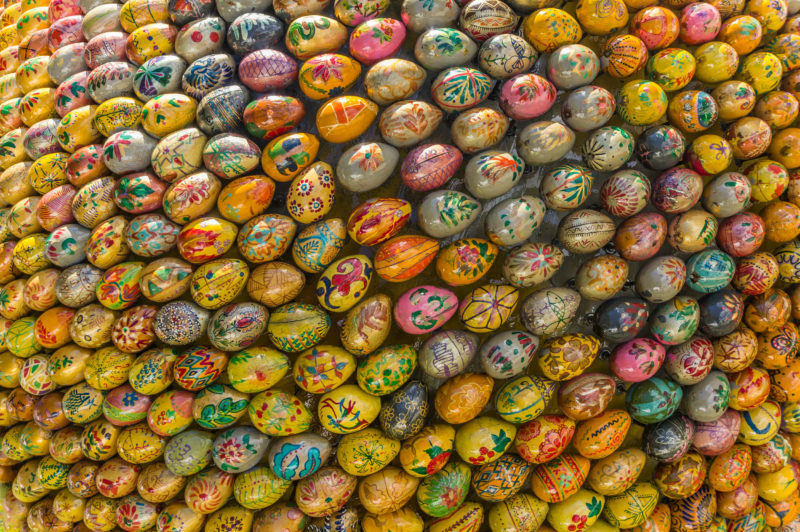 Once Christianity took hold, the egg was adopted as a religious symbol of the Easter celebration and pysanky designs took on Christian significance. The ancient sun designs now stood for the Son of God, triangles stood for the Holy Trinity and stars showed God’s love toward man. The symbolism was likely lost us as kids but pysanky as an art project was plenty cool. Even cooler was the legend that making pysanky kept evil at bay. It has been told that far away there is a very large and evil monster chained to a cliff. This monster has servants who travel in every country each year taking a tally of how many pysanky have been made. 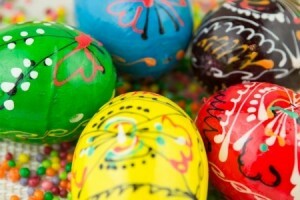 Each year that less eggs have been decorated, the monster’s chains are loosened and there is more evil in the world. If ever there were no pysanky made, the evil one would be released and he would destroy the world. But, in years that more pysanky are made, the monster’s chains are tightened and the power of love and the goodness that the pysanky bring is felt throughout all nations. Pretty good reason to make pysanky, isn’t it? Makes me want to break out the beeswax candles and the food dye. Khrystos Voskres! Love those memories of making pysanky. Daddy and Laura wre better than we were. We came in 3and4th. Thanks for posting.